nicu's FOSS'n'stuff: Best of both worlds? From time to time I help a bit a NGO (won't enter into details now, there may be some common projects to talk about later, some older were covered on my photography blog, is a foundation helping mothers that had children die), this time they bought a couple of netbooks, for some activist to get some work done, Considering the budget and the requirements I put my FOSS in the closet and recommended some Acers with Windows 7 Starter, they are going to be used by some basic users (think "girl scouts but at a mature age") who won't learn a new interface or new software, they need something they feel comfortable with and I won't school them. 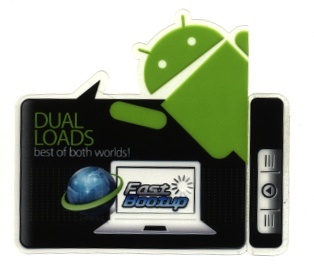 The computers came to me to make them useful (remove tons of pre-installed crap, add some useful things, switch the defaults to Firefox and VLC and so on), and, much to my surprise, when lifting the screen I saw this cute sticker with the green android popping from the edge and saying "dual loads. best of both worlds!" One thing to notice: the arrow in the top-left corner say something like "Go back to Windows". And the sticker is true: the boot is fast, not instant. Since it was not my computer, and I didn't want to leave my Google account data in it, the computer was not able to do much anyway. 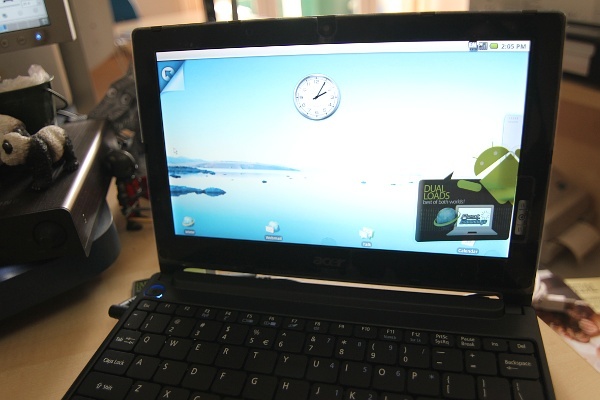 So back to Windows, hide all Android traces (it would completely confuse the users), finish the setup and pass the netbooks forward. Now, honestly, my best hope is the they will use at least GIMP instead of a pirated Photoshop (small image editing is one of the target use), on this I put my foot down, when asked to teach some graphic editing, my reply was: I teach only Free Software, Photoshop I don't use and don't know.